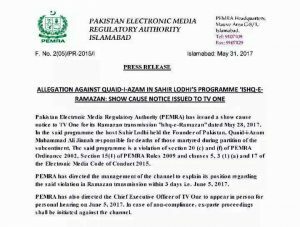 Pakistan Electronic Media Regulatory Authority (PEMRA) has issued show cause notice to TV One over its show Ishq e Ramzan hosted by Sahir Lodhi. During the show Sahir accused Quaid e Azam of being responsible for killing of thousands of people during partition which didn’t go well with the country and PEMRA. The show stirred a lot of controversy when the host insulted a debate competition participant over nothing and gave an aggressive speech. The channel has been asked to explain its position till June 5, 2017.